Billionaire mega-media mogul and Dallas Mavericks owner Mark Cuban is part of a group starting a new pro football league that will compete with the NFL for players and will play on Friday nights. It’s a pretty simple concept. We think there is more demand for pro football than supply. I’m all for breaking the monopoly the No Fun League has on broadcast pro football. But I’m surprised Mark Cuban doesn’t get that this won’t work. 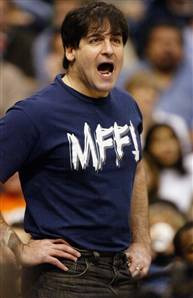 Hey, Mark, three letters: X-F-L.
Will CubanFL Fail Faster than This Year’s Dallas Mavs? If Cuban wanted to get networks to cover his new league and strong arm sponsors into funding it, he should consider a women’s league. The WNBA has proven that you can get worse ratings than the XFL and still exist . . . so long as your league involves inept, masculine “female” athletes. You gotta love a guy who has so much money that he blows it on stupid business ventures. He’s typical of the twenty-somethings that were lucky enough to capitalize on the dot-com wave. He’s rich not because he was a smart businessman, just lucky. His previous and present investments highlight that fact. I hope he keeps spending. Sooner or later the well runs dry. However, if he’s going to throw all that cash away, I would not be opposed to having some thrown my way! Friday night is for high school football. Period. You are partially correct, Mark Cuban did not get lucky. He is a con man that got away with securities fraud with the help of the Clinton Administration that approved his dot com scheme. I hope he goes bankrupt, he has screwed alot of honest people to get his ill gotten wealth. OK Scotty.. you got me. I was being a little too nice about it. I hope he goes broke as well. I was one of the more virtuous folks who passed on dirty money and got killed for it. Well, I still have my honor… and many of those who worked with are actually behind bars. There is some justice, I guess. I read your posts and know you would never back this scum bag. It just appalls me the number of stock market con artists that were able pocket billions during the Clinton Administration. Another one is John Corzine who made well over 1 billion at Goldman Sachs after being forced from Goldman Sachs in January 1999 when the feds began to investigate the deals that transpired during his reign. This crook then went onto buy a senate seat for 60 million with his ill gotten wealth that he screwed from investors during the dot com boom at Goldman.He was appointed to the Senate banking committee and the investigation was stopped into Goldman Sachs. Now he is Governor of New Jersey after buying that office for over 45 million where he is probably stealing everything that is not nailed down. Mark Cuban, John Corzine, and another hundred or so stock swindlers made billions during the Clinton Administration and it just pisses me off that the MSM never brings up their criminal backgrounds and treats them like royalty.